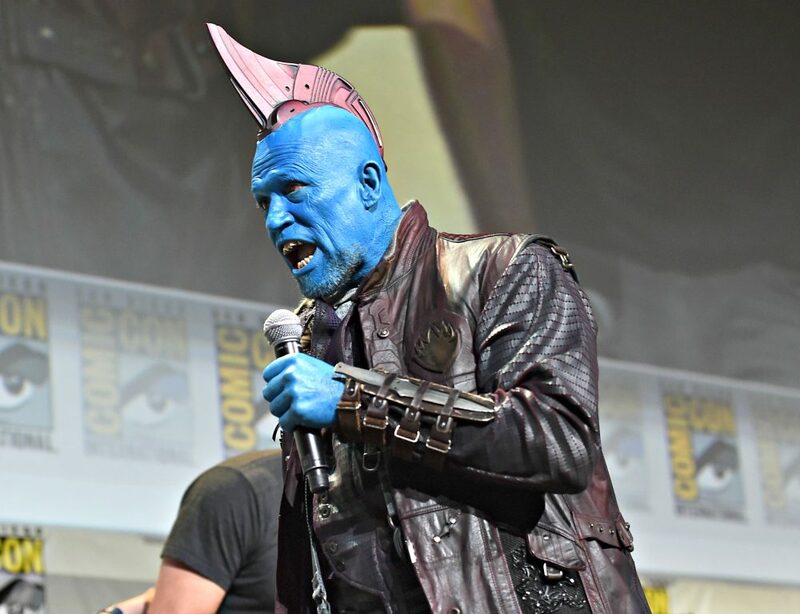 This Michael Rooker interview with him in full costume as Yondu was one of my favorites, but it honestly turned out to be the worst actual interview. We didn’t get much content in the form of questions and answers, because, well, he was so interested in us! 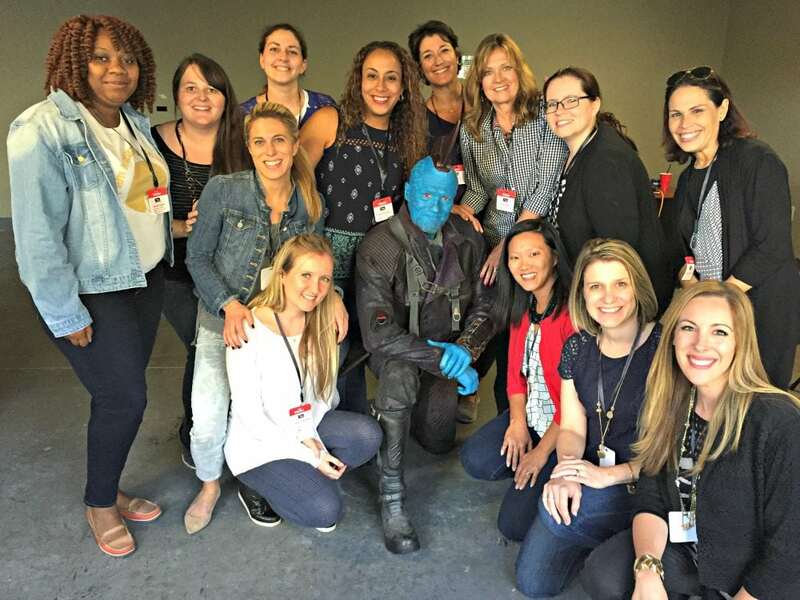 He took the time to look each of us in the eyes, ask us about our lives, find out where we’re from, and made each and every one of us feel special. This man LOVES playing this role. He’s so into it, it’s as if you’re talking to an excited child that can’t wait to show you everything like show and tell. He cannot contain it. It’s incredibly endearing. 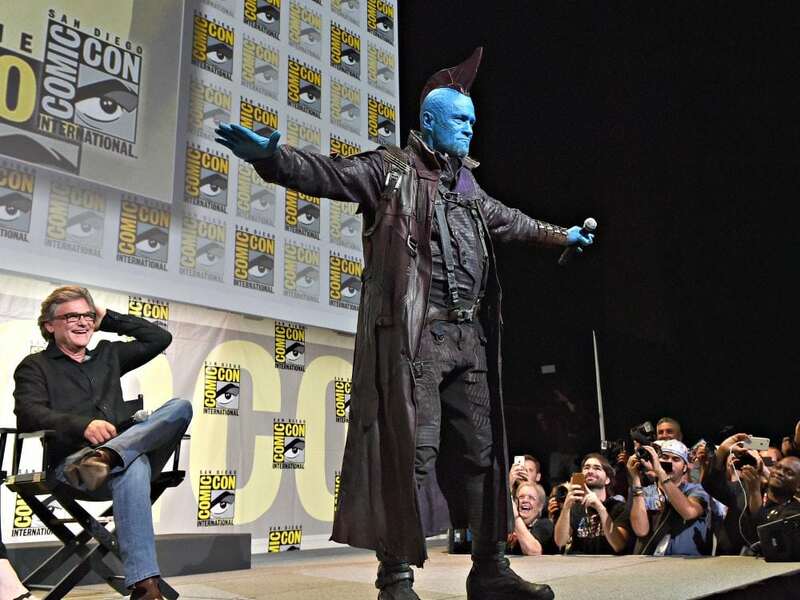 Michael Rooker walked in and immediately started showing us the details of his wardrobe and makeup. He first got real close to each of us to show us his gnarly red eyes–which are, of course, contacts. He also brought in his teeth and put them in so we could see the HUGE difference they make in his look. When we all gasped at the transformation he said, “I do the same thing when I saw myself in the mirror with it.” They make it difficult to hold normal conversation and he explained how he had to learn how to talk with them in. His makeup takes about two hours to complete and he said, “Half of this is makeup and half of this is just me. I’m like a blue man from Kentucky. 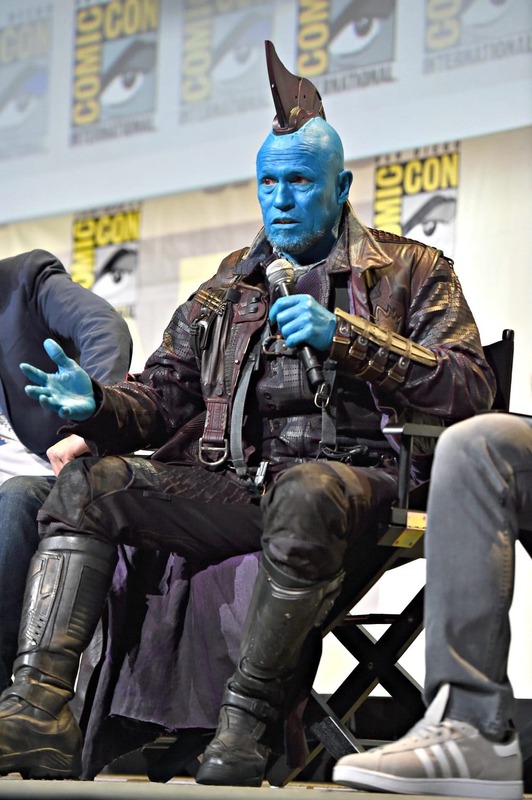 You know they have real blue people in Kentucky… they’re called ‘the Blue People of Kentucky. '” I’ll be Googling that later. 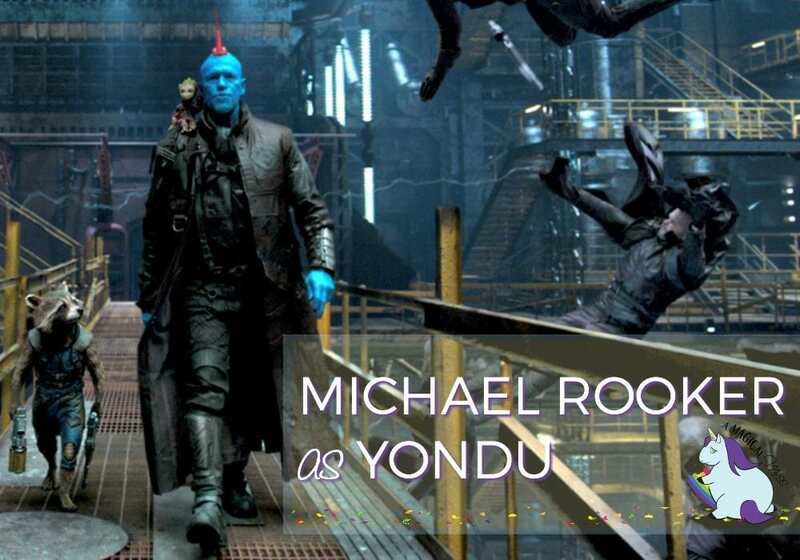 Michael Rooker: ” Yeah, it’s awesome. The fin’s not heavy. Not at all. It’s hollow and I thought they were going to put lights and different things in it, but they decided not to. They just decided to keep it ‘natural’ and not, well… what’s natural? It’s a fin growing out of my head. So, they didn’t put the lights in. 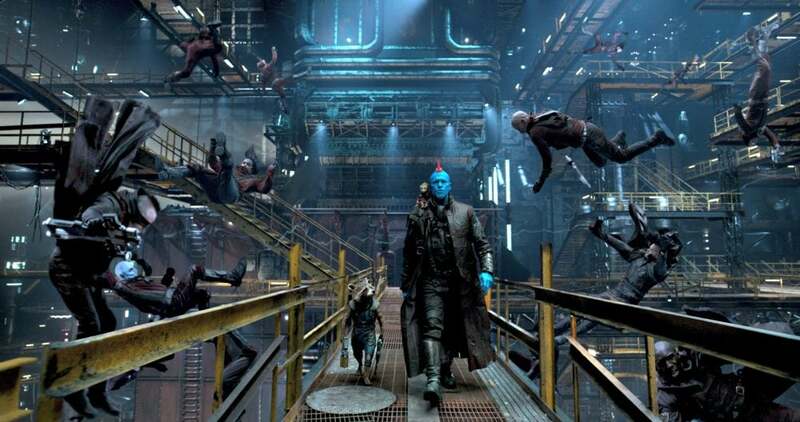 Have you teamed up with some of the Guardians of the Galaxy? How did you feel about that shift when you read the second script? Do you hope the audience sees a different side? How hard is it to get into character? Have you been doing a lot of stunts? Is that your actual whistle? Who is your favorite character besides your own? We were out of time for questions because he had to get back on set. But we had time for a quick group photo. He hammed it up and did a couple of different poses with us and demanded that he get a selfie on his own phone. While taking the photos he kept pointing out all the different little details on his clothing and saying “You can touch it, it’s so cool!” Seriously, it was like being with my son when he was little on Halloween. He was so impressed with all the new tiny details they’ve added or changed to his look. I love his childlike passion. This man is a ball to hang out with. 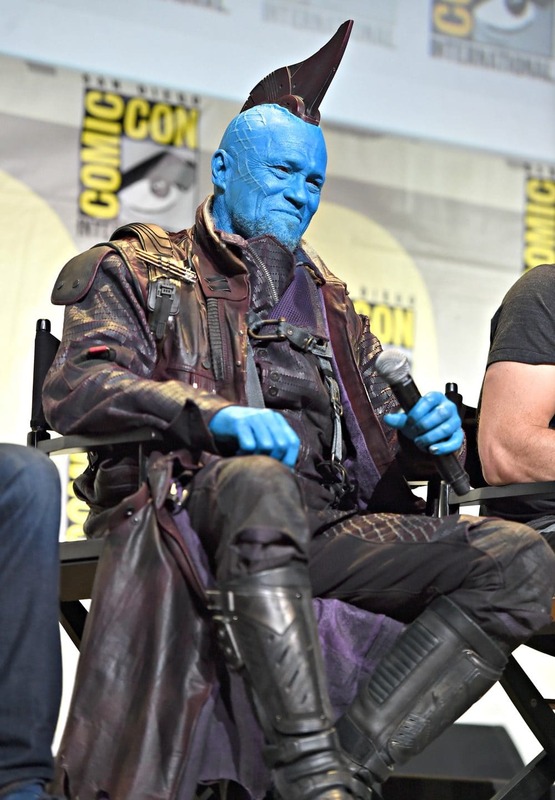 For more Micheal Rooker, read this post from Walker Stalker Con!